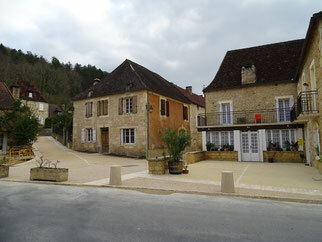 Campagne, village of Périgord, crossroads of roads of the valleys of Dordogne and Vézère, is a pleasant hamlet, ideally located at the crossroads of big tourist sites located in Eyzies, Le Bugue, Sarlat or Montignac. "Le Bourg", composed of old houses, a church with various styles, a castle and a park recently renovated and with a heavy history, is not lacking interest and charm and encourages a friendly visit . The Many places of the commune, sometimes more populated than the Village, also deserve the detour and gain to be discovered. The castle was built at that time and the various events quickly transformed the country territory into a co-management led by 4, then by 2 "coseigneurs". Because of this, there were 2 adjoining castles which have cohabited for nearly 500 years. David de la Borie of Campagne put an end to this situation by buying back the part of the other lords in 1756. 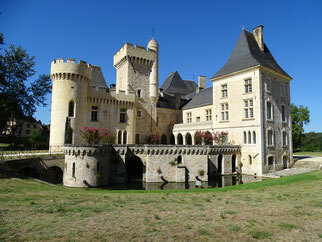 His son, Géraud, who finally altered the two buildings deeply by making them join after a succession of enormous works. Several lords and then marquis succeeded one another at the head of the domain until Raoul de la Borie de Campagne, in turn, modified the castle between 1865 and 1882 for the final and present form. Raoul did not content himself with modifying and magnifying the castle, he endowed his jewel with a magnificent setting by creating a superb park made with the help of the Bordeaux nurseryman Jean Jaques Rousseau. Of English influence, like all the parks that were made at the time, nearly 10,000 plants and trees were planted in order to present us still to this day a romantic and paradisiacal place. The castle then lived its great hours and little by little, was then abandoned by its owners, divided between Campagne and the Castle of Fou near Châtellerault. The last Marquis, Gerald de la Borie de Campagne, who had no descendants on February 14, 1970, gave the state, in this case to the Department of Excavations and Antiquities, under the Directorate of Heritage. Its castle, the commons and the adjoining park. At the time of its donation, the castle was in an advanced state of disrepair, work on the roofs allowed to safeguard it, and then it took more than 40 years for the castle to be ceded by the State to the Department. Immediately, the latter decided to renovate it and redo it from its park of yesteryear. The Park is open everyday between march and October, and during all the hollydays periods. Have a look at the end of this page, and see what is to see and to do on our small commune. We will be very happy ti meet you !